The Ascot Bar Stool Mink Velvet is a great option for adding a touch of luxury to your bar area. 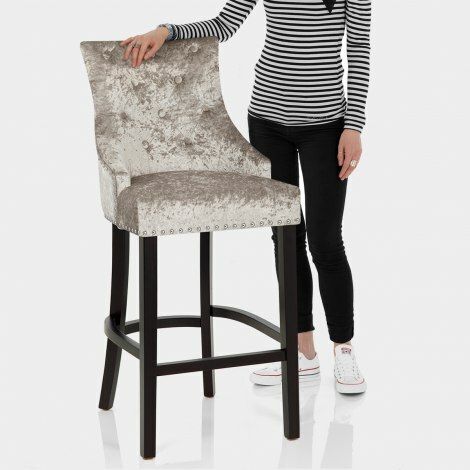 A modern twist on the classic dining chair style, the Ascot Bar Stool makes for a spectacular statement piece. Upholstered in elegant mink velvet, the seat offers quality comfort with a belted seat pad. A high backrest with quilted button detailing adds to its grand design. With chrome studs edging the seat and a fashionable chrome ring on the rear, this design exudes a sense of opulence. At fixed kitchen worktop height, the solid wood frame provides a sturdy base, whilst the dark wenge finish creates a striking contrast with the upholstery. Protective feet plugs also help to preserve flooring. "Just love the way these complement our kitchen"
Great quality and price, stools look fantastic. Ordered yesterday arrived today beautiful bar chairs got them to match my dining chairs. Atlantic shopping are A class sellers thankfully I will be buying from your company again. Just love the way these complement our kitchen! Absolutely stunning, great quality and delivered quickly. Would highly recommend these stools and the company service! Bought 3 x Ascot stools and 6 matching chairs in mink velvet. Beautiful products, fantastic service. Fast delivery and completely hassle free.